On October 8th a chemical attack was committed against the Kaihu habitational module on Rens VI Brutor Tribe Treasury station. This attack has left 23 dead, my sister in the hospital, and another dozen individuals – some who I knew – missing. Kaihu was my home, once. My family lived in the Kaihu Sebiestor tribal dormitory after we arrived in the Republic from the Empire, and later an apartment in the northern part of the ward. I took repatriation courses in Kaihu, I got my voluval and joined the Fjörkir Clan there, and I served God doing volunteer work at the local Salvation Church (really a basement we rented from a local deli that wasn’t using it). I worked in Kaihu’s environmental services department, who are out there now with other station workers trying to clean up the ward. Years have gone by since I left to become a capsuleer, but it was my home. The attack on Kaihu was, without a doubt in my mind, carried out under the orders and authority of Khanid Sa-Baron Alar Chakaid, who, a day before the attack, made threats against my life. But rather than target me, he went after my family, my friends, and my community, thinking that I wouldn’t be brave enough to retaliate. It must be understood how extreme a measure it is to attack the baseliner friends and family of a capsuleer. Where a capsuleer is “immortal” (in what ever means you define this), our baseliner friends and family are not. This makes them the obvious target for those who wish to deal lasting, permanent damage to someone who cannot otherwise suffer it. Going after a capsuleer’s baseliner kin is a vast escalation over the normal affairs of capsuleer conflict. This is something that cannot be permitted. In response to the attack on Kaihu, a retaliation strike was facilitated by Mizhara Del’thul on my behalf against property and assets held by Lord Chakaid on Zirsem V. The initial offensive targeted a facility hosting the 19th Royal Uhlans, a clone mercenary regiment under Lord Chakaid’s command. Despite cloning facilities being some of the most well-secured locations in New Eden, the attack was successful. Most of their clone stock – a significant portion of them heavily-modified combat clones – were destroyed, including Chakaid’s. This attack was a warning, to Lord Chakaid, and to anyone else who thinks it wise to target the families of capsuleers. The cluster should know by now just how powerful and terrible capsuleers are. If you come for our loved ones, the shackles come off, and not even your immortality will save you. Relent, and this will be the end of it. Continue, and the next attacks will be much less restrained. We have the resources to make this as bloody as you want it. This is not an action I wanted to have to live with. But it needs to be demonstrated that the intentional targeting of a capsuleer’s family will not be allowed to go unpunished. This is extremely unfortunate decision making on your part. I understand your pain, but this response can only make things worse. Expected exactly this. Cower some more, weakling. Cower as they come for your kin. That’ll fix it. We have known for some time that you have the strategic sense of a rock and seem to delight in playing into your opponents hands. It is only unfortunate that you have drug Samira into your insanity. It’s deterrence, Lord Admiral. A failure to respond in kind would carry its own problems. You did exactly what the person behind these attacks wanted you to. That is hardly a deterrence. Ordinarily, Mizhara would be all “So attacking baseliners is a thing now” due to her long standing scepticism about the powers of capsuleers. But with her apparent involvement in this incident, then I guess that point is moot. Why target the khanid horses ? Maybe. But the alternative was do nothing. Target of opportunity. Represents a blow to what is a cavalry unit’s pride and, if there were no backups, the potential loss of irreplaceable genetic material for ancient breeds no longer able to be produced naturally. Anyway it would seem that sub baron @Alar_Chakaid was willing to foment discontent in the Ardishapur realms, implicating the Ammatar in the attack in Rens, and indeed to attack Imperial holders on Oris. 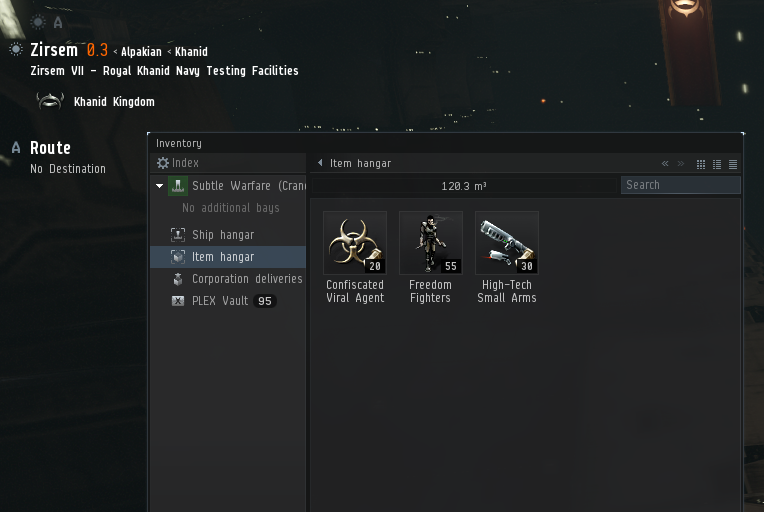 With the potential to ignite a war between parts of Amarr. So either the sub baron was acting on the orders of the King, in which case the Khanid Kingdom should now be regarded as being at war with the rest of the Empire. Or the sub baron was not acting on the Kings orders, in which case he has A Lot Of Questions to answer. So which is it, @Alar_Chakaid ? Are you a rebel or a traitor ? Chakaid is in all likelihood a Blood Raider who cares for nothing but power. This attack likely not only won’t deter him but give him the justification he wants to do more of the same, potentially even openly. Your rash decisions have in all likelihood made him even more dangerous. This entire situation is beyond out of hand. Without a shred of real evidence you’ve attacked the Plenipotentiary Representative of His Majesty Farokh Khanid III. Given this and other recent statements I’d say your rehabilitation was a catastrophic failure. Lord Khalil Numayr should be ashamed at the abysmal job the Governor of Dam-Sertene has performed. I imagine he will think twice about leasing out any more of his stock under custodial servitude contracts. I, for one, have never known Samira to tell a lie, or otherwise bear false witness. No one is accusing Samira Kernher of lying. The accusation is more along the lines of being exceedingly foolish, acting on insufficient evidence, and actively supporting a terrorist attack. Given our long association with Samira, an official PIE statement on this matter will be forthcoming within the day. Until then, PIE inc pilots have been asked to avoid further comment. The wild Slaver hound can expect no sympathy when its prey kicks back. For once I am going to agree with Mizhara that the posts of the various Amarr supporters here reek of cowardice. Or perhaps it is simply convenience, since it wasn’t your people who where targeted? If somebody attacks you, you attack back, let this be but the first and not the last incident to take place. I mean, what exactly do you want to do, sit him down for a nice cup of tea? Deal with him the same way you “dealt” with Nauplius? Oh yeah, that’l go well. It’s odd how I suddenly find myself siding with Del’thul and Samira Kernher. Chakaid got what he deserved and the Retaliation was against military targets, so a proper way to do it rather than the cowardly attack against civilians. Is this how PIE rewards the people who has served you? Just waiting and watching while their family was attacked? Chakaid is in all likelihood a Blood Raider who cares for nothing but power. This trait seems to be found among many Khanid (and Amarr for that matter) Holders as well. Behold! The face of evil unmasked! For all the false piety and the arrogant presumption to understand the nature of Holy Amarr’s destiny, the savage heart within the breast of the Minmatar remains dark, tainted and corrupt. Can there be any doubt in the minds of those who remain true to Holy Amarr? Attacks on the loyal Holders of Oris and the nobility of the Khanid Kingdom of the Empire are the work of enemies without and within! The True Amarr and loyal, elevated races of Khanid and Ni-Kunni know what must be done! The filthy rot must be cleansed and traitors, rebels and cultist heretics cast out! By the blood of my troops, I swear that there will be an accounting. Even so, we shall not stoop to the base level of the subhuman rebels and traitors. A petition has been filed with the Theology Council’s representatives at the court of His Royal Majesty King Farokh Khanid III. I trust that the unity of Holy Amarr and its Demesnes and Kingdoms will not be fractured but it is sure that those who pander to the Minmatar rebels and the treacherous Ammatar must search their souls after these outrages. Matari Invictus, shitpail. Come at my people again. I dare you.